Automotive EVAP Systems Market size is estimated to exceed USD 65 billion by 2025; according to a new research report by Global Market Insights, Inc.
Increasing vehicular emissions along with rising awareness regarding air pollution will drive the automotive EVAP systems market size over the forecast period. Fuel tank temperature further increases with the heat coming from various sources including exhaust system and engine leading to evaporation. Moreover, escalating fuel evaporation during vehicle parking, operation and refueling are inducing significant potential for industry proliferation. Stringent government regulations pertaining to fuel evaporation will escalate the automotive EVAP systems market size. In North America, the U.S. government implemented regulations including CARB LEVII and EPA stage II to improve the air quality. Moreover, in Japan, Infrastructure and Transport (MLIT), the Ministry of Land, and Ministry of the Environment (MOE) have set the limits for automotive evaporative emission. 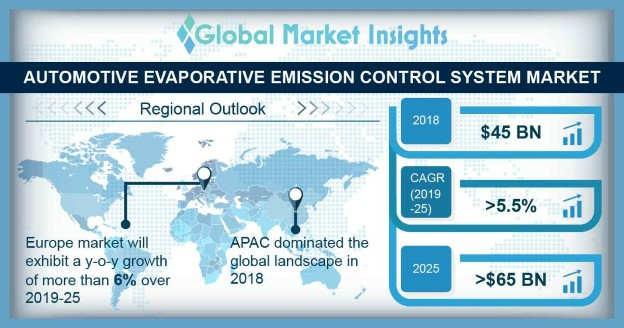 Rising installation of automotive systems to enhance fuel economy and reduce fuel losses will propel automotive evaporative emission control (EVAP) systems market growth. According to Plastic Fuel Tanks and Systems Manufacturers Association, approximately 20% of the hydrocarbon emissions originate from evaporative sources. Vehicle manufacturers are equipping vehicles with systems to reduce running and permeation losses thereby driving the product demand. Ongoing initiatives by international organization such as EPA, UNECE, to reduce fuel evaporation will escalate the automotive EVAP systems market share over the projected timeframe. For instance, 40 CFR part 1066 provides regulations for the required testing procedures for measuring exhaust, evaporative, and refueling operations. Emergence of vehicle testing procedures for vehicular pollution will positively influence the industry size. Passenger cars hold significant share in the automotive EVAP systems market size owing to rising vehicle production. According to OICA, in 2017, the PCV production increased by around 11% as compared to 2013. Growing adaption of stringent government regulations is continuously driving the product demand. For instance, in October 2018, Indian government announced to shift towards BS VI standard by April 2020. Sensors will exhibit considerable growth over the projected timeframe owing to its usage to monitor pressure and fuel level in the tank. The pressure and level sensor ensure that the pressure does not exceed that threshold limit and vapors are transferred to the engine intake manifold. In addition, installation of purge sensors with control valve to check vapor transfer will expand the industry share over the next six years. OEM segment leads the automotive EVAP systems market share owing to installation of EVAP systems to meet government regulations. Manufacturers are minimizing the component size to reduce weight and vehicular emissions. Moreover, the system providers are involved in designing components with unique design for environment and safety concerns escalating the industry size. Aftermarket segment will witness substantial growth over the study timeframe with emergence of test procedures such as California Evaporative Emission Standards and Test Procedures to monitor vehicle performance. Latin America will hold a considerable revenue share in the automotive EVAP systems market size on account of increasing concern to reduce fuel evaporation along with implementation of stringent international policies to curb air pollution. Further, countries such as Mexico is emerging as key destination for automotive investments. Companies such as Nissan, Delphi, General Motors, Continental, and Volkswagen are establishing their R&D center and engineering plants in Mexico thereby escalating the regional growth. Major players in the automotive EVAP systems market includes Delphi Technologies, Eagle Industry Co., Ltd., Didac International, TI Automotive, Plastic Fuel Systems, Padmini VNA Mechatronics Pvt Ltd, Robert Bosch, Standard Motor Products, Inc, Sentec Group, Stant Corporation, and The Plastic Omnium Group. Joint ventures and collaboration are among the major strategies adopted by industry players to strengthen their regional presence. For instance, in December 2017, Standard Motor Products, Inc. announced joint venture agreement with Foshan Guangdong Automotive Air Conditioning Co., Ltd. to expand its geographical reach. Further, this transaction enabled company to enhance its presence in the automotive aftermarket segment.